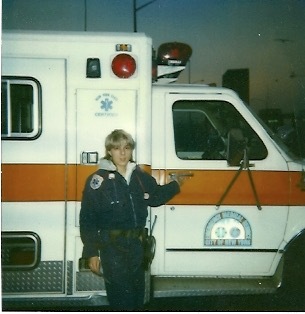 For 24 years, I was a 911 paramedic at St. Clare’s, a small hospital in Hell’s Kitchen. I worked during the dawn of AIDS, the influx of crack, and the most violent years the city has experienced. My hospital had the highest percentage of homeless patients in the city in the 1980s. In 1985 we established the first AIDS unit on the east coast. Broke-Down Palace is the story of the city as seen through the lens of one poor, unsupervised institution. It begins in 1934 with the founding of the hospital by a penniless Irish nun in the depths of the Great Depression, and follows the course of its existence until 2007, when it was shut down, flipped a few times, and turned into luxury condos. The book is structured as a series of linked poems; a memory palace. In addition to exploring the story of the hospital, I am interested in what happens to memories. What becomes a part of history, and what doesn't? If I took part in historical events, e.g. the AIDS plague, the attack on the World Trade Center, can I turn the historical narrative into one that actually reflects my experiences? to be physically brawling with the staff. in a messy pile on the sidewalk. streetlight glinting from his black sunglasses. blinking my eyes against the stench of rubbing alcohol. walks by on his way back from a coffee run. have gotten dressed out in front of St. Clare’s." Sunday, June 18, 5pm. I'll be reading and showing a video I made at the Slipper Room, 167 Orchard St. near Stanton St, MYC. I'm reading with Gene Albertelli, David Evenbach, and Yetsuh Frank. $10 admission. Thursday, November 3, 6:30pm sharp! I'll be reading with Adrian Sangeorzan in the Prose Pros reading series at Sidewalk Cafe, 6th Street and Avenue A, New York City. Here's a video of a reading I did for the Sparkle Street Social and Athletic Club series at the Howl Gallery in New York City. The series is hosted by Mike DiCapite and Ted Baron. I come on midway through the video, and read for twenty minutes. I was recently interviewed for the Sholem's Bias Podcast by author/physician Zachary Sholem Berger. I talk about the book, read a poem from it, and talk about working 911 in the 1980s and 90s. Come on by! Free and fun! 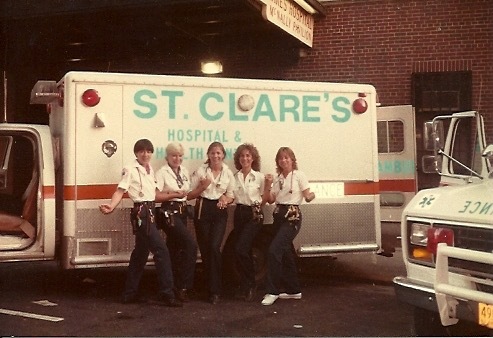 This will be a rotating series of images from my days on the ambulance at St. Clare's. This is me in 1983 or 1984 "cleaning". I still have some of my old uniform from HHC on (the vest). My partner Lucy and I in the mid-1980s. West near the river on the night shift, mid-late 1990s. 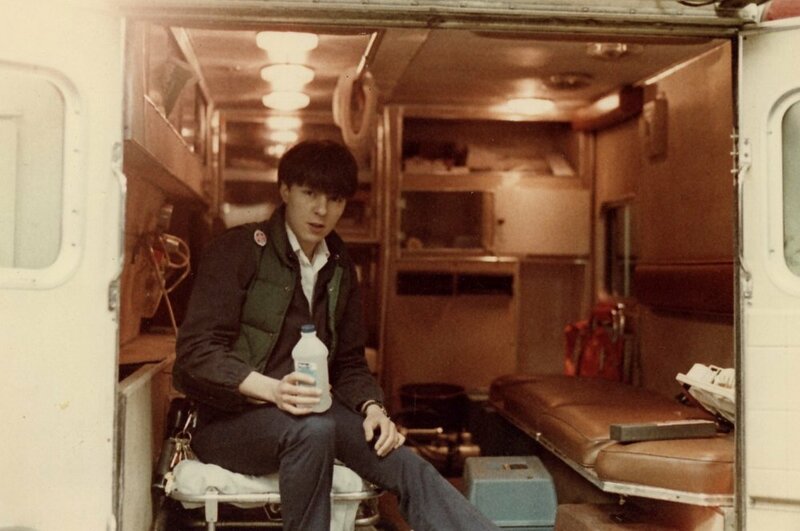 This is probably early 1990s, in our elegant and comfy ambulance room. 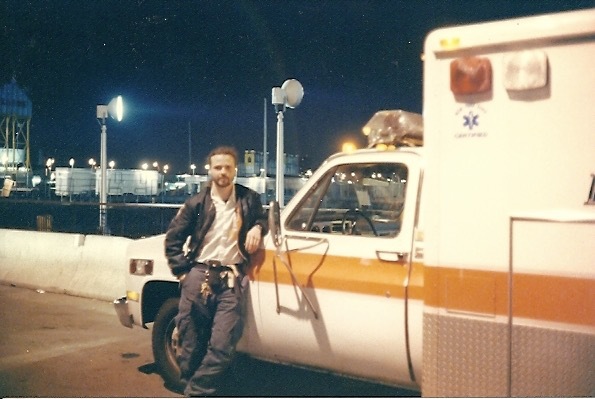 Mid-1990s, my partner Steve with the ambulance, taken near the Hudson.